Do you want to learn how to read sheet music for different string instruments and find the notes you need on your instruments? 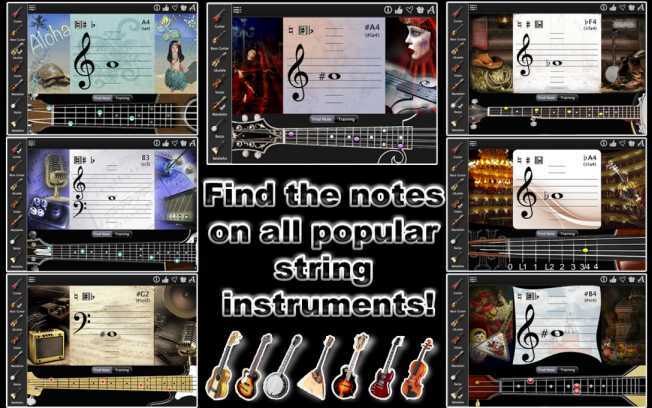 Notes Finder lets you choose from 7 different instruments: guitar, bass guitar, violin, mandolin, ukulele, banjo and balalaika. 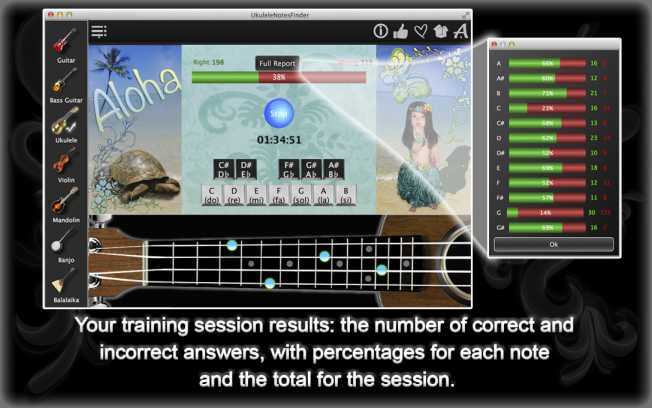 You can improve your music-reading skills using this app just a few minutes a day! Choose one or more instruments! 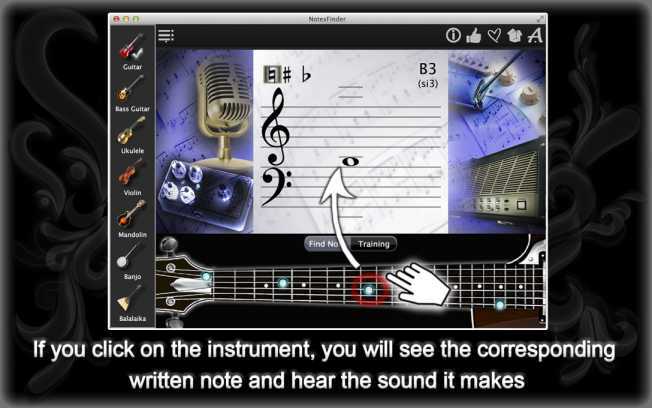 All instruments in this app come with adjustable volume and training range. 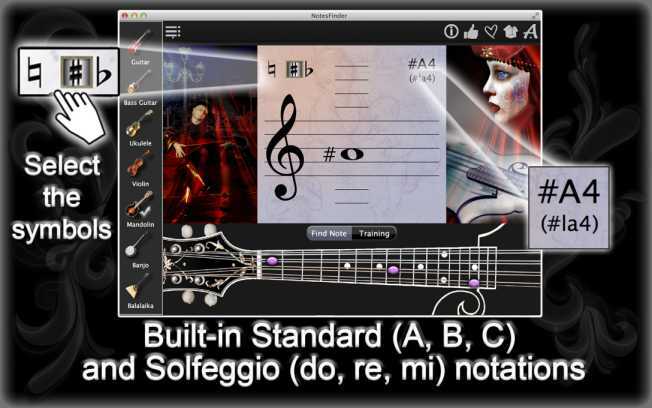 For guitar and bass guitar, you can also choose your preferred notation type. Notes Finder has 2 modes: Find Note and Training. Find Note lets you explore different notes. Select your instrument, and move your finger up or down the virtual music sheet to find the note you need. At the same time, the bright dots on your selected instrument will show you where to find this note, and if there is more than one position for the note on your instrument, you will see multiple dots. Tap notes on the music sheet to hear their sound. 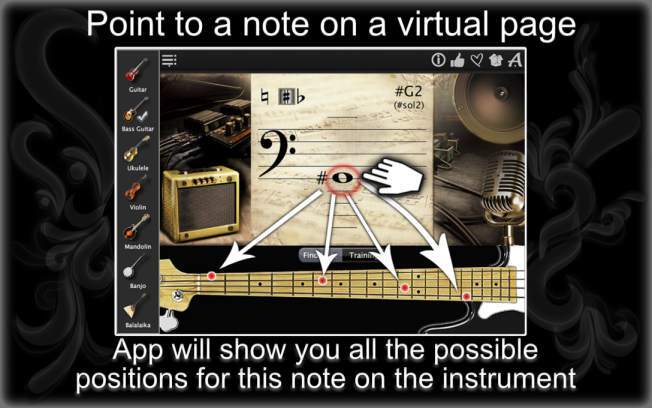 You can also do this in reverse and tap the virtual strings to find notes. The notes on the virtual music sheet will change accordingly. If you already know a few notes, you can go to Training. When you tap Start, the app will show you a dot on the virtual instrument of your choice. The dot represents the note you are supposed to find. Put your knowledge to the test, and measure your progress every time you play!